The City of Sugar Hill would like to congratulate Senator Renee Unterman on her receipt of the of the 2018 Champion of Georgia Cities Award from the Georgia Municipal Association. This award is given at the end of every two-year legislative term to state legislators who actively support major initiatives and goals. The Georgia Municipal Association recognizes Senator Unterman for the efforts to help local governments have consistent control over home rule and to challenge legislation that attempts to thwart that control. Some examples of the legislation that Senator Unterman stood firm with were SB 469 Building Code Pre-emption and SB 418 Preemption of Retail Sales Regulation/Puppy Mills/Synthetic Opioids. This same legislation would have limited the control of local governments to regulate businesses such as pet stores that use puppy mills for inventory supply. Senator Unterman is a fighter that protects the authority that allows Georgia’s cities to deliver quality of life services for their residents and works to expand economic opportunities across the state. She sponsored the Brunch Bill SB 18 which allows local governments to change Sunday alcohol sales hours through a ballot referendum. The Mayor and City Council of Sugar Hill wish to thank Senator Unterman for defending Sugar Hill, Gwinnett County and all of the citizens of Georgia. Senate District 45 could not have a better leader in the State Legislature. 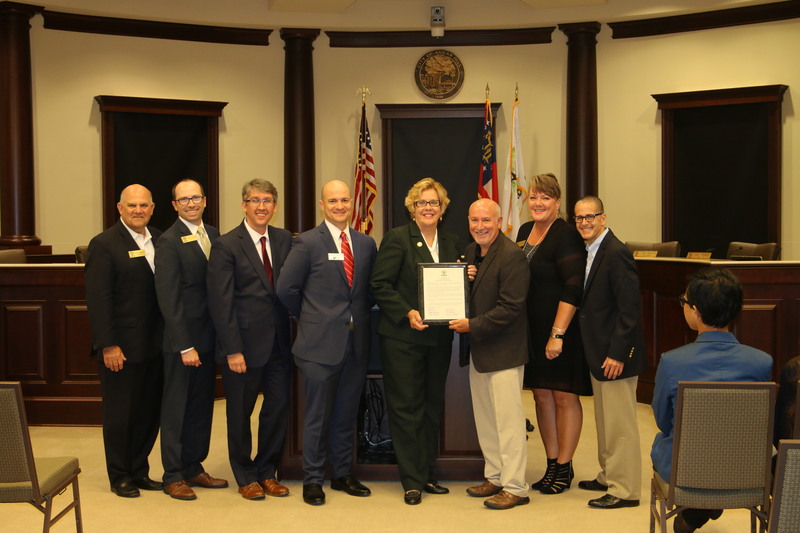 NOW, THEREFORE, the City of Sugar Hill Mayor and City Council extend congratulations to Senator Renee Unterman for being recognized as the 2018 Champion of Georgia Cities Award and request that all citizens join in recognizing September 10, 2018, as Senator Renee Unterman day in Sugar Hill. So, proclaimed this 10th day of September 2018.